The Captain of the Alcatani Fellowship. I've been pushing my painting speed a little and developing techniques to get quickly painted non metallic metal and facial tones. So I put aside an hour to finish a single model, the captain of the Alcatani Fellowship. To be fair, I have already practiced the method a few times on the rest of the unit, which definitely helped. I took 3 20 minute sessions with this guy. One for the armour, took closer to 30 though. One for the face and leather, easily within the 20, and the last one for the rest of the bits (sword, hammer etc). I'm not 100% happy with the hammer, but I'm pleased with the rest. 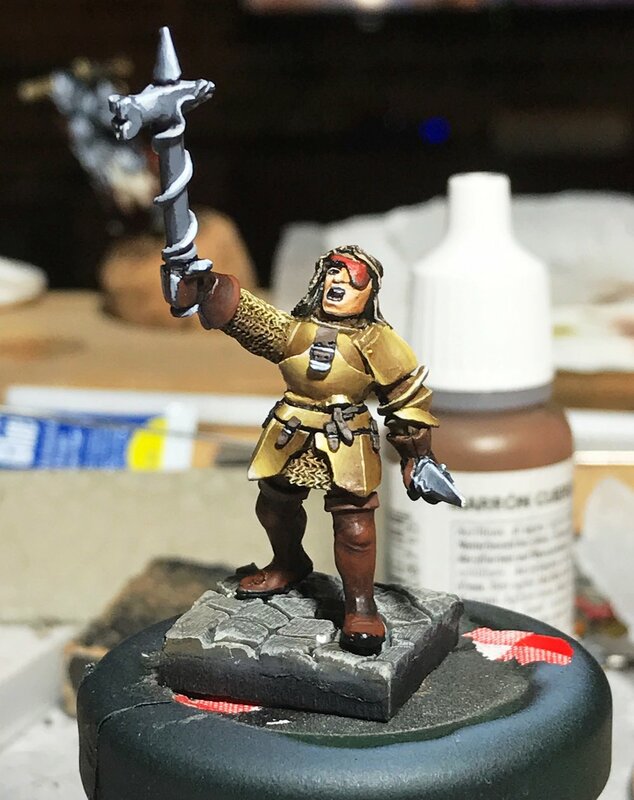 I think I still have a little work to do on my gray NMM technique when I'm not using the loaded brush. Anyway, the Socius Alcatani is nearly done, just a few models to complete the unit and some clean up and banner work. I don't have a lot of time to paint right now, only 4-5 hours per week, but I'm really enjoying this unit and pleased with the results so far. Hopefully my next update is a completion post. That's what's on the bench today.